Description:Used 2009 Hyundai Trailer Chassis for sale - Call Online Auction #685-17289 (Ends 5.2.19) Online Auction for Government Surplus - Auction Ends 5.2.19 - To view auction details go to www.govdeals.com and "Search For" 685-17289. Click the QAL box and then hit search. GovDeals.com is the online platform where you can bid on and buy government surplus. Price is subject to change at any time during ongoing auction. 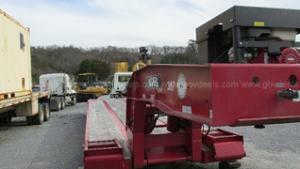 You will be bidding on a 2009 Hyundai CGN30-500 Trailer Chassis. CERTIFICATE OF ORIGIN AVAILABLE. The agency is reporting this item has been sitting for a while but was rarely used by the agency. This item may be missing parts and the overall operating conditions are unknown. Repairs may be needed (exact repairs needed unknown). Additional info: Inspection recommended. Approximately 30‘ L overall. GVWR 59,000lbs. This property is located at MUSC in Charleston, South Carolina. The overall condition of this property is unknown to the Surplus Property Office. Description:Used 2007 Rolling Star Command Trailer for sale - Call Online Auction #12924-2 (Ends 4.30.19) Online Auction for Government Surplus - Auction Ends 4.30.19 - To view auction details go to www.govdeals.com and "Search For" 12924-2. Click the QAL box and then hit search. GovDeals.com is the online platform where you can bid on and buy government surplus. Price is subject to change at any time during ongoing auction. 2007 Rolling Star Goose Neck Command Trailer - govdeals.com 2007 Rolling Star Goose neck Command Trailer Length: 48‘ Width 8.5‘ Height 13.5‘. Six (6) wheels, three (3) axles. Unit is a goose neck pull behind trailer. A/C, closets, fixtures, lights & security system.